Looking to remove hard water stains? Try these Clear View Products! 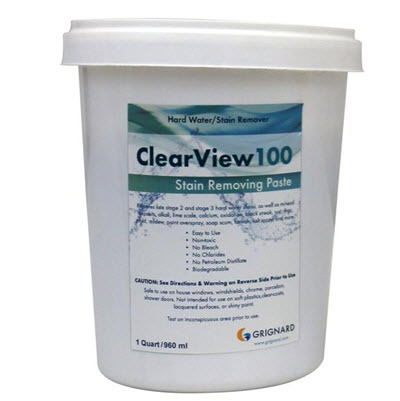 Clear View 100 removes stage 1, 2, and 3 hard water stains, as well as other build up such as mineral deposits, rust rings, mildew, and more. This product is biodegradable and non-toxic paste. Want to use something fast and easy for stage 1 and 2 hard water stains? 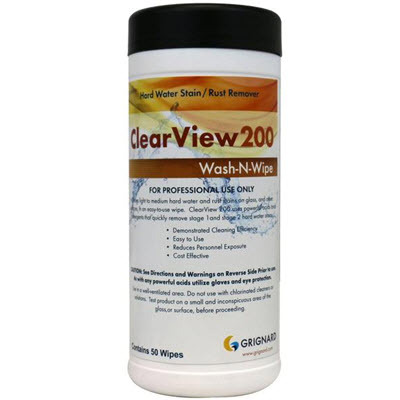 Try the Clear View 200 Hard Water Wipes! These wipes are infused with a proprietary solution to effectively remove moderate hard water stains while reducing exposure from splash and runoff. One container contains 50 wipes. 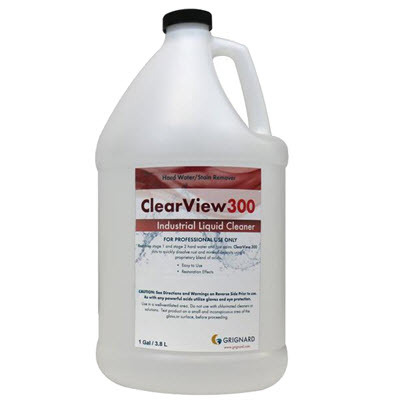 The most aggressive Clear View product is in liquid form which is effective in removal of stage 1 and 2 hard water and rust stains. It helps with dissolving rust and mineral deposits through the utilization of a proprietary blend of acids. That Clear View 100 product that you mentioned has gotten our crew out of some serious situations where the customer has sprinkler systems throwing water on their windows. Great product!